Inhabited for thousands of years by coastal Native American tribes, Astoria is the oldest American settlement west of the Rocky Mountains. Lewis and Clark spent the winter of 1805-06 just west of Astoria at Fort Clatsop. John Jacob Astor’s Pacific Fur Company began operations there in 1811, and built Fort Astoria, only to have it and the trading enterprise sold to the British just a few years later. By 1847, Astoria was a significant outpost and is home to the first U.S. Post Office west of the Rocky Mountains. In the late 19th century a large immigrant population from Scandinavia and China provided the necessary workforce to catch and process salmon, for a burgeoning market worldwide. The salmon population was seriously depleted by the 1920s and local companies turned to catching and processing tuna. By the 1980s, the tuna industry had moved on to other locations, and Astoria began a slow move toward re-defining itself. The Lewis and Clark Bicentennial sparked a significant rebirth of the community in 2005-06 and since then Astoria has become well-known for its rich heritage. Andrew B. Hammond came to Oregon in 1894 from Missoula and began an aggressive acquisition campaign, snapping up railroads and timber interests, including the Astoria and Columbia River Railroad. Hammond recognized that the salmon industry was over-capitalized and in 1899 began buying, organizing, and consolidating packing companies into the CRPA. His vision involved acquiring all the salmon canneries on the Columbia River, which would operate as one company. When the CRPA formed in 1899, it acquired the holdings of seven packing companies, for a total of 10 canneries. CRPA ultimately merged with Castle and Cooke, Inc., in 1961 and changed its name to Bumble Bee Seafoods. Bumble Bee had been a brand used by CRPA from its beginnings, at first used exclusively for bluebacks, or Columbia River sockeye salmon. Eventually as salmon runs diminished, and the company canned more tuna, Bumble Bee took on additional importance. For over 130 years, the Hanthorn Cannery has been a presence on the lower Columbia River. It has been known by many names, including Hanthorn Cold Storage, CRPA Cold Storage, Bumble Bee Cold Storage, Astoria Seafood, Astoria Cold Storage, and others. J.O. Hanthorn started the operation in 1875, processing salmon. Before entering the salmon packing field, he had been a tinsmith, which gave him an advantage in the industry. The Hanthorn brand of salmon was well known all over the world. By 1894 the plant was producing 30,000 cases of canned salmon annually. Unfortunately, in 1891 his daughter Hazel fell through a trapdoor in the boatshop floor and drowned. Hanthorn was devastated by this loss and had great difficulty adjusting after her death. 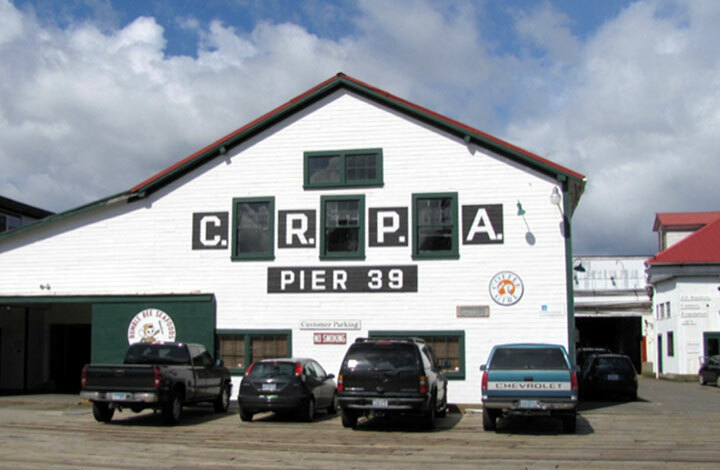 A few years later he sold the cannery to the Columbia River Packers Association (CRPA) and left Astoria. The oldest building at Pier 39 dates to 1875. It is currently the second floor of the center building and was placed on top of a lower story in the early 1900s. Today it houses a variety of offices. By 1908 the facility had eight buildings on the pier, including cold storage units that currently house the Cannery Museum. In 1932, the cold storage units on the east side of the pier were constructed. These serve as storage for many of the artifacts the Foundation has collected. In 1943 more buildings were constructed on the west side of the complex, and today these contain the Rogue Public House. The facility at one time also had a copper shop, butchering room, fillet room, liver picking area, net wharf, and a Chinese mess house. This website has been funded in part by the Oregon Heritage Grant Program, Oregon Parks and Recreation Department.